Jason Collins, Michael Sam, Derrick Gordon: Is open homosexuality contagious? 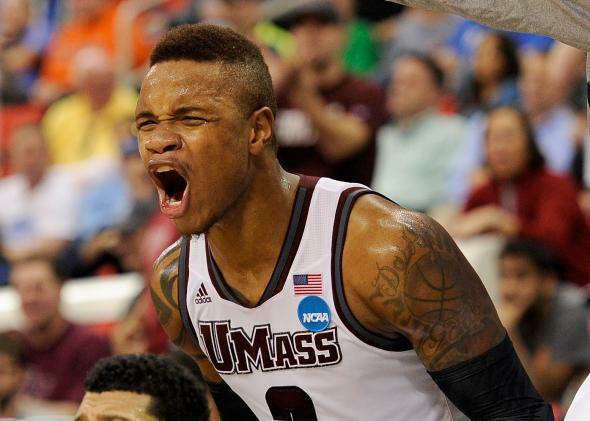 Derrick Gordon at the NCAA Men’s Basketball Tournament, March 21, 2014. First it was Jason Collins. Then Michael Sam. Now Derrick Gordon. One openly gay athlete leads to another, and another, and another. Collins is in the NBA. Sam, a college football player, is trying out for the NFL. Gordon, a sophomore at the University of Massachusetts, came out today as the first openly gay player in Division I men’s basketball. When he came out, I wanted to come out the next day. It was a relief, like “About time!” Like, “Finally, it happened!” But I still couldn’t jump the gun, because he wasn’t in the NBA at the time when he came out. But when he went back, that’s when I started to build a little more confidence. … I watched as he was getting subbed into the game, and everybody stood up and started clapping. And I was visualizing myself as that being me, but for college. … And it definitely put a huge smile on my face. He was just really giving me advice and just letting me know that if I ever need anything or need to talk to him about anything, that he’s always going to be there for me. He gave me the confidence and the boost that I needed to put me over the top to coming out. People think that gays shouldn’t be allowed to play sports, or they’re too soft, or this and that. From the looks of it, I know Michael Sam isn’t soft, and Jason Collins isn’t. And for one, I’m not soft. And I think people misinterpret that, when it comes to being gay. … I’m still going to be the beast guy that I am. Essentially, Gordon’s interview confirms that public homosexuality and its acceptance are contagious. For Gordon, seeing Collins come out was a relief and a spur to speak up. Having Collins’ pledge of support also helped. But so did the crowd’s reaction when Collins entered his first game after returning to the NBA. The fans stood and applauded. Gordon visualized getting that kind of reception. He wasn’t afraid anymore. He began to believe that he would be celebrated. Gordon was in middle school long before his predecessors came out. Collins wasn’t out. Sam wasn’t out. They didn’t make Gordon gay. They just made him feel safe about letting go of his secret. And they trashed the stereotype that gay men couldn’t be bruisers. So, yes, open homosexuality is contagious. Just not in the way its repressors feared.